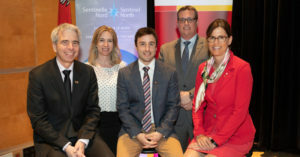 Three Sentinel North Research Chairs were launched on May 9th 2018, in the presence of the Sentinel North executive director Martin Fortier, the Faculty's dean André Zaccarin, the VP research Eugenie Brouillet and the president of Laval University, Sophie d'Amours. See University Press releases here, here and here (in French). 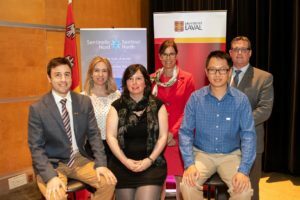 The three chairholders: Raoul-Marie Couture (Aquatic Geochemistry), Caroline Ménard (Neurobiology of stress), and Gary Wong (Influenza surveillance network). Very happy to receive my 1st @NSERC_CRSNG Discovery Grant ! Definitely a milestone for me in the Canadian research funding system. Grateful for the support and comments from colleagues @ChimieUL who were very supportive. Looking forward to the next 5 years ! Copyright © 2019 Aquatic Geochemistry Group at Laval University. All Rights Reserved.